The legendary Charles Dickens and his beloved characters Ebenezer Scrooge, Oliver Twist, Tiny Tim and scores of others have proliferated and endured in popular culture, inspiring film, art, TV and academia for nearly two centuries. 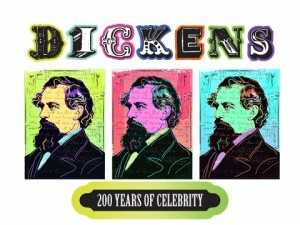 Institutions and organizations worldwide are commemorating this author and social critic by celebrating the bicentenary of Dickens’ birthday throughout 2012. Mixing classic artifacts and pop-culture references, the Lake County Discovery Museum’s newest original exhibition, Dickens: 200 Years of Celebrity, opening September 29, introduces Dickens as the first international celebrity of the modern age. Hundreds of objects and documents from the exclusive private collection of local Highland Park Illinois resident Michael A. Weinberg, together with a rare collection of first editions of his most famous works, tell the story of how Charles Dickens and his characters became enduring cultural icons. The exhibit runs through February 24, 2013 and is sponsored by the Daily Herald and the law firm of Novack and Macey LLP. A variety of interactive and multi-media displays and personal effects take visitors through a chronological tour of the life, literature and legacy of Dickens. View his personal traveling inkwell used on a trip to America and his home at Gad's Hill, take a ride in an early century carriage, and learn about the memorable characters, stories and themes of his famous tales through games, time period puzzles and Dickens' own personal Facebook page. Celebrate the holidays with A Dickens Christmas, a special extra exhibit opening November 17 which encompasses the classic Dickens tale A Christmas Carol. Stroll through a mid-1800s street to learn how Dickens influenced the look and feel of the holiday season, and view a private collection of vintage cards and calendars. Call 847-968-3400 or visit online at LCFPD.org/Dickens for more information about the exhibit or to download discount admission coupons. Follow the Museum on Facebook and Twitter @LakeCoMuseum or visit LCFPD.org/Dickens for dates and times of special Dickens programs and events. The Lake County Discovery Museum is located on Route 176, just west of Fairfield Road and east of Wauconda in Lakewood Forest Preserve. Gallery hours are Monday through Saturday from 10 a.m. to 4:30 p.m., Sunday from 1 p.m. to 4:30 p.m. Admission is $6 for adults, $3 for seniors ages 55 and older and students ages 18 to 25, and $2.50 for youth ages four to 17. Children three years and under are free. On Discount Tuesdays, admission is $3 for adults, free for youth 17 years and under. Admission is always free for Museum members. The museum is accredited by the American Alliance of Museums.